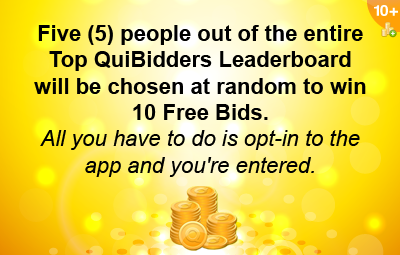 Home / The Top QuiBidders Leaderboard – Earn Free Bids and Gameplays! UPDATE (1-21-2015): We have removed the leaderboard and updated the ways you can earn rewards. Go here to learn more. UPDATE (1-31-2014): Scoring has been updated! Please see this article to learn more about the changes. We love when QuiBidders like you are been able to utilize our Top QuiBidders promotion as a way learn bidding tips, discuss strategies, earn rewards like Free Bids and Gameplays, and not to mention connect with other bidders all over the world to create some truly amazing friendships. The Top QuiBidders Leaderboard has clearly added value to our page, but we realize that there’s still a lot we can do to improve the overall experience for you – our beloved customers. We’ve listened to your feedback about ways to improve this promotion, and we’re happy to provide our Top QuiBidders promotion with a new scoring method, better rewards and even more ways to win them! Keep on reading to see what we mean. What is the Top QuiBidders contest? 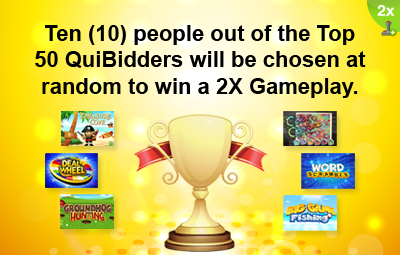 The Top QuiBidders contest is a way for you to earn rewards (like Gameplays and Free Bids) for your contributions to the QuiBids community on Facebook. You can earn points to improve your Leaderboard ranking by doing activities such as commenting or liking something we posts on Facebook. You can also earn bonus TQ points for other notable activity, of which we go into more detail below. Our goal is to utilize this contest to recognize those who are making our Facebook community more and more vibrant every day. Since we updated this promotion on November 1, 2013, we were able to increase the Gameplay multipliers and also add a new reward (10 Free Bids) that anyone can win, regardless of your Leaderboard rankings – you’d just have to opt-in to the Top QuiBidders application on Facebook to be eligible. To do this, simply click “Login” when you first access the application and be sure to approve all of the permissions. Below are the awards you can win. You will still be able to receive +1 TQ (Top QuiBidders) point every time you like or comment on one of our posts, but you can also earn bonus points for the following activity. 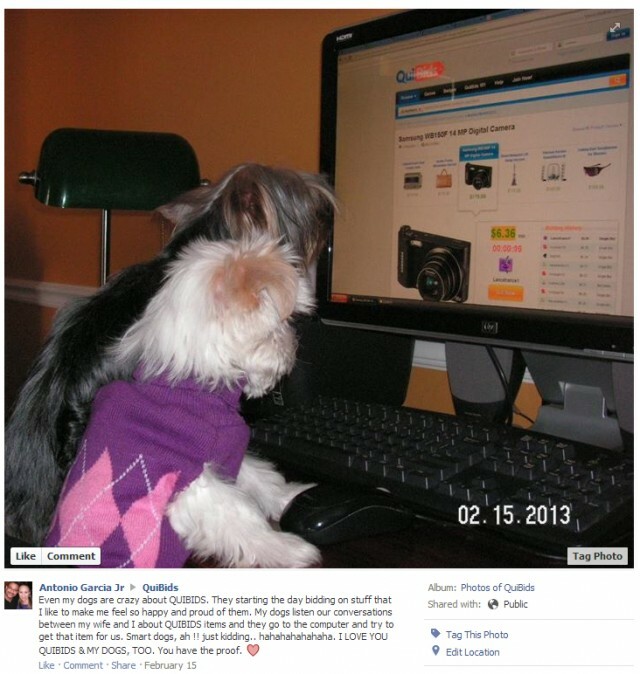 The next time your product comes in the mail, take out your camera and pose with it for a picture. 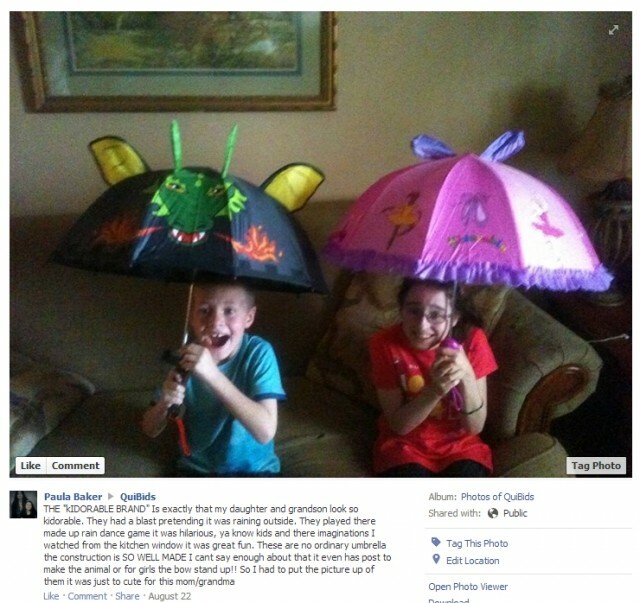 Then post the pic on our page and tell us about it in the description. Be sure to include the auction details like how many bids you used, what the ending price was, were there a lot of bidders, etc. The better your post is, and the more details you provide, the more points you can earn. Be sure to include yourself in the photo along with as much information about the auction as you’d like to give. 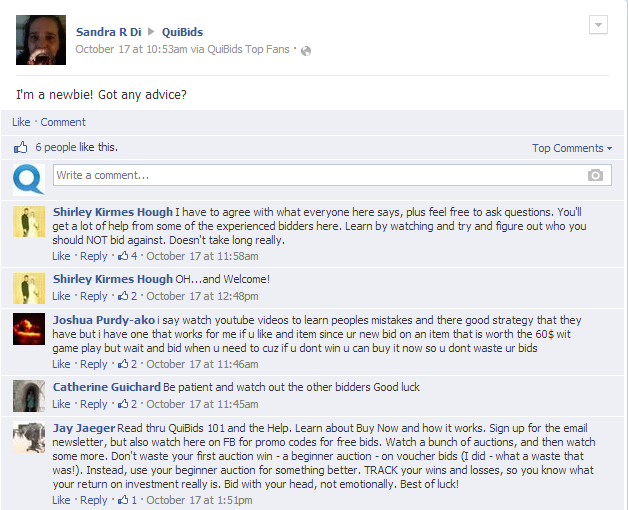 Basically, anything that’s related to QuiBids and relevant to our customers. Don’t feel limited to just the above list. Whether you want to ask an open-ended question, write a song, perform a happy dance, or any other direction your creative juices take you, if it’s about QuiBids and relevant to our customers, there’s a good chance you’ll get some bonus points for it. We love a good cat photo just as much as the next person, but when these photos start pushing down other helpful posts on our timeline, it starts hurting the relevancy value of our page. 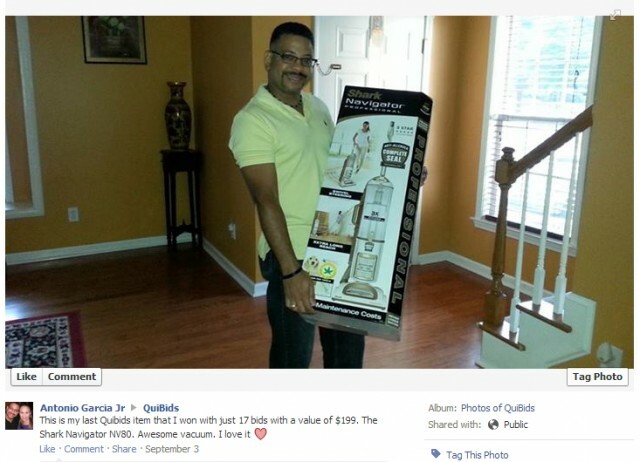 So please only post a photo when it is relevant to QuiBids. This includes Good Morning/Afternoon/Evening and holiday posts. However, this doesn’t mean that you must stop posting these things altogether. It just means you need to be a little more creative with your post. Try coming up with a way to make it Q related, like this funny photo from Antonio. Try to keep all the comments on a particular topic together in the same post instead of starting a new thread. We understand this can be hard to do after some time has passed, but just keep this in mind when participating in conversations on our page. The reason for this is because it makes it easier for other QuiBidders (and us) to follow and participate in the conversations taking place. If you’re about to make a post about another person on our Facebook page and it could be taken as “not very nice,” then we suggest you refrain from posting it. It doesn’t matter if you mention the person’s name or not. If your post is about another bidder with the intention of calling them out, ridiculing them, complaining about them or being sarcastic, you will lose points and have your post removed. Let’s be real, we’re all here because we love QuiBids and love winning. So please keep this in mind when someone else has a different opinion from you. If you ever feel offended or uncomfortable by a comment from another bidder, please don’t respond to the comment. Just send us a private Facebook message and we’ll review it. If the problem persists then the user can be banned from our page. Also, we recommend blocking the offensive person when this happens so they can no longer see or comment on your stuff and their posts will be hidden from you as well. If you need help with this, send us a private message on Facebook and we’ll walk you through the steps. Just remember this: If you’re going to reference another customer, your best bet is to do it in a positive way or don’t do it at all. If you want to report a bidder for cheating, please do so in a private message or in an email to Customer Support. If we discover someone using more than one Facebook profile to cheat and earn more points, both profiles could be removed from participating the Top QuiBidders promotion. If you suspect someone of cheating with multiple profiles, please submit your evidence to us as a Facebook message. Please don’t post things that don’t make much sense, or similar posts multiple times just to get points. These types of posts have no benefit to our customers and could be removed from our page to make room for the more helpful posts. As always, foul language, spam, or personal attacks are not allowed on our page and could result in being banned permanently. We care a lot about respecting the privacy of bidders. So before you post about a certain bidder’s real name, past wins, or auction activity, make sure you provide details that can be easily found somewhere on our site. We will remove any posts that we feel is revealing personal information without the person’s consent, and these posts can cause you to lose Top QuiBidders points as well. 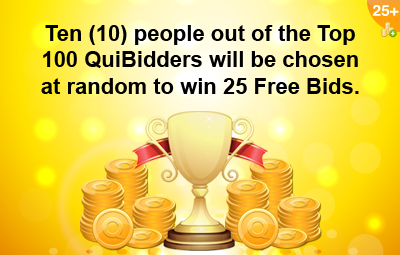 Click HERE to go to the Top QuiBidders Leaderboard! What do you think about the updates? Tell us in the comments below! *Bonus Points are awarded/removed at the discretion of QuiBids.